How to Add a Vignette Effect Online? Taking photos has become an important part of our social lives because we all love sharing vacation photos or an occasional selfie on our social media accounts. Even though iPhones and Android phones are often equipped with powerful cameras capable of producing high-definition images, you often have to edit your photos in order to highlight a certain scene or a detail or to simply make the colors in the picture more vivid. The vignette effect that is often used to draw the viewer’s attention to the center of the photo is one out of countless effects you can use to make the photos you take with your smartphone or your DSLR camera look more visually attractive. There are a lot of online photo editing platforms that let you add a vignette to a photo effortlessly, and in this article, we are going to introduce you to some of the best free and paid options you can find on the World Wide Web. FilmoraPro allows you to add vignette and vignette exposure effects to video. You can apply the preset vignette effects such as HD Heavy, HD Moderate, HD Soft and HD Vintage and customize the settings such as horizontal stretch, vertical stretch, softness, curvature and strength settings. Click the Free Download button below and try FilmoraPro free. How to Add Vignettes to Your Photos and Videos Online? When choosing an online photo or video editing platform you need to consider factors like the price of the service, file size limitations and the diversity of tools supplied by the platform. Furthermore, a vignette effect won’t look great on any photo, since centrally composed shots are usually much better pick than wide angle shots that depict a lot of space. Here are some of the best online photo and video editors you can use to add vignettes to your videos. 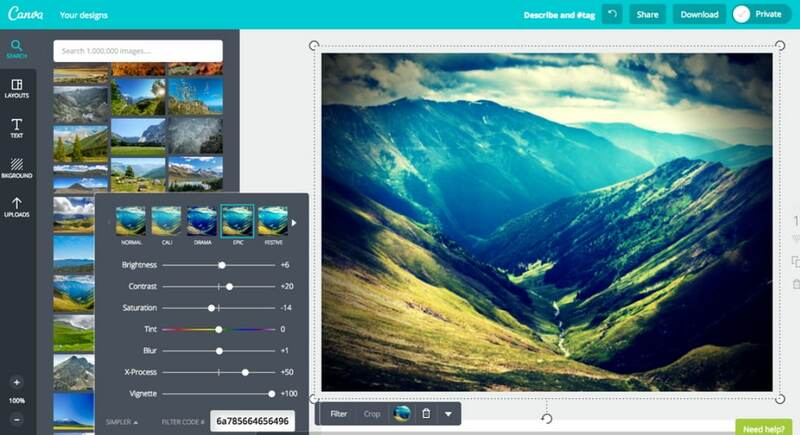 When you arrive at the Fotoram.io’s homepage, you’ll be offered a choice between Edit, Collage and Art Style options. Click on the Edit button to access the app’s photo editing mode and then upload a photo from your computer or from Facebook. At the bottom of the photo editor’s screen, you’ll be able to see a toolbar that contains icons like Crop, Rotate or Sharpen. 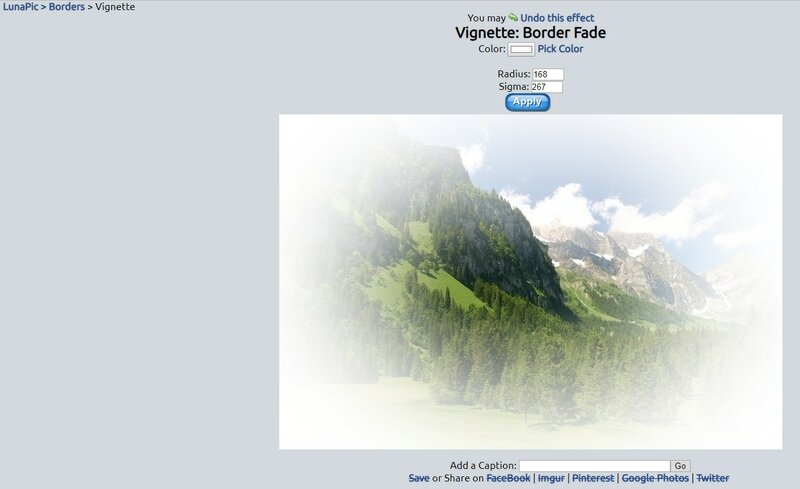 Click on the Vignette icon that is located at the end of the toolbar, and use the Amount and Saturation sliders to create the vignette effect. Click on the Save button if you want to save the edited photo to your computer or hit the Share button if you would like to share the picture on Twitter, Facebook or Tumblr. This simple photo editing platform offers a variety of tools you can use to enhance your photos. 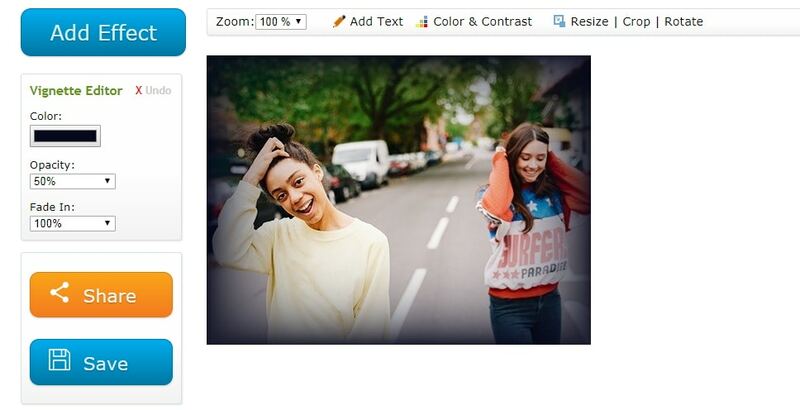 Scroll down to the Edit Edges – Fade, Crop & Overlay menu and click on the Vignette Editor option. Once the new page loads you should click on the Choose File icon in order to select a photo you’d like to add a vignette to and then proceed to adjust the Color, Opacity, and Fade In options. Clicking on the Save button enables you to save a watermark-free photo to a hard drive on your computer, while by clicking on the Share icon you can share the photo on some of the usual social media suspects. The process of adding a vignette to a photo with LunaPic is quite simple since you just have to click on the Border menu and select the Vignette option to start creating this effect. You can either upload a file by pasting its URL into the Choose File box or you can click on the Choose File icon and upload a photo from your computer. LunaPic’s Vignette effect lets you pick a color of the vignette, and you can also insert new values into the Radius and Sigma boxes. The changes you make won’t be visible on the Preview Screen until you click on the Apply button, but you can always undo the effect if you don’t like the result. Even though the platform offers basic video editing options, you can’t use it to add vignettes to video clips. This online platform for graphic designers, lets you edit photos, create collages or design your images. In order to add a vignette to a photo with FotoJet, you just have to access the photo editing mode and make sure that Edit menu is selected in the toolbar. You can find the Vignette option in the Advanced section of the Edit menu, so just click on it and use the Intensity slider to choose how much of the effect you want to apply to the picture. The lack of vignetting tools as well as the fact that you’ll only have a limited amount of options at your disposal until you purchase one of the pricing plans make FotoJet a relatively poor choice if you just want to quickly add a vignette to a photo. The list of filters, effect, and frames this photo editing platform offers is incredibly long, but the best part is that you just have to upload the photo and the online application will apply the selected effect automatically. Click on the All Effects menu on the website’s ribbon, then scroll down to Stylized Effects and click on it. When a new page loads you will be able to choose from a number of preset effects such as Old Photo, Black&White or Double Exposure. Click on the Vignetting effect and proceed to upload a photo from Facebook or any other online destination or from your computer. As soon as the photo is uploaded the platform will automatically apply the vignette effect to the photo so you can click on the Save&Share button to post it on your social media account or save it to your computer. Canva is yet another popular online destination for graphic designers on our list that offers a wide range of photo editing tools. Before you can start designing or editing your images you must first create an account and make sure that you’re signed in. You will be taken to your profile page where you can choose the type of project you want to work on. 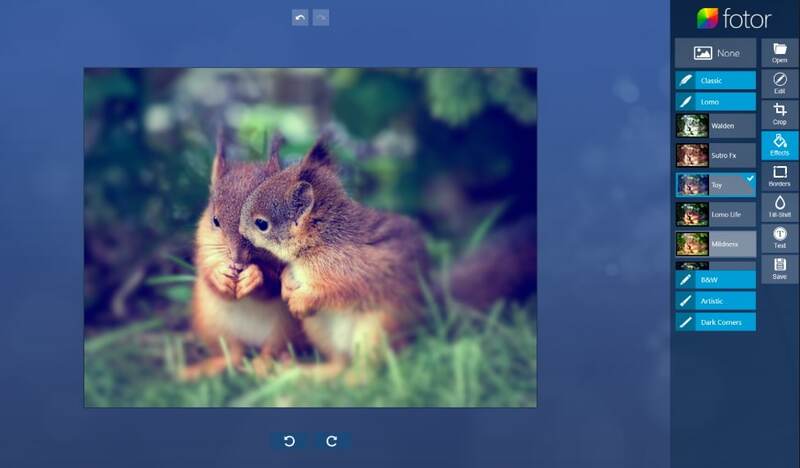 The photo editor will appear on the screen after you select one of the available project options, so you can click on the Uploads button if you want to add a vignette to your photo or you can use some of the royalty free images supplied by the platform. Click on the Adjust option to bring up the Adjustment panel and drag the Vignette slider to the right in order to apply the effect. 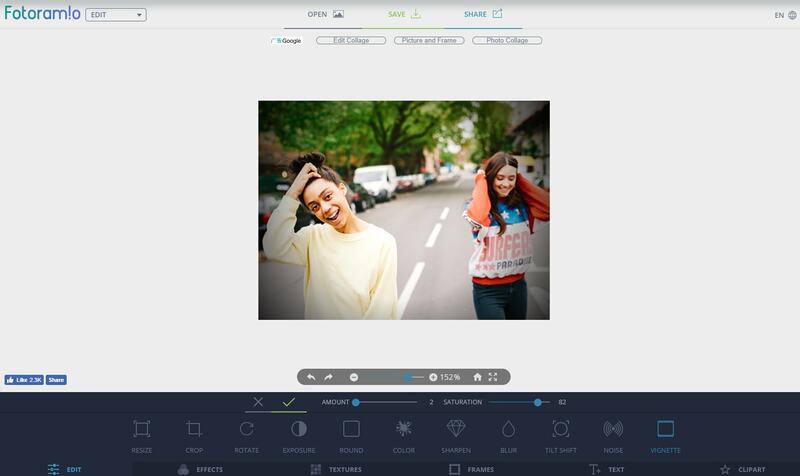 This photo and video editing platform lets you create vignettes in just a few simple steps. Upload a photo or video to Kapwing and click on the Adjust tab in the Editing panel after the file is uploaded to the platform. 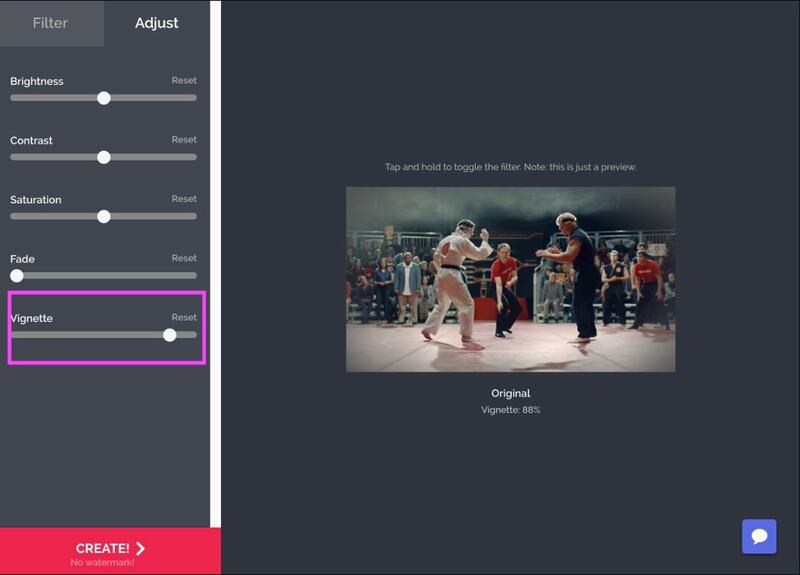 This will grant you access to options like Brightness, Contrast, Fade or Vignette, so you just have to drag the Vignette slider to the right in order to add the effect to your video. When done, you should click on the Create button and the platform will automatically process the footage. All photos and videos you export from Kapwing will be watermarked if you’re using the free version of the platform, and you need to pay $6 to remove a watermark from a video. Alternatively, you can purchase a monthly subscription and export an unlimited amount of videos and photos each month. You can add a vignette to a photo in just a few minutes if you choose to edit your pictures with Fotor. Once you arrive at the platform’s homepage, click on Edit a Photo button in order to gain access to the app’s photo editor. When the new page loads, you should click on the Open button to choose the source from which you want to upload a photo, and then after the upload process is complete you just have to expand the Basic menu and click on the Vignette option. Use the slider to adjust the intensity of the effect and when done you can click on the Share or Save icons. However, if you don’t have an account on this platform you won’t be able to share or save your creations. Adding a vignette to a photo or a video online is a fun and simple process that demands a minimum amount of effort and it is up to you to discover creative ways in which you can use this effect to enhance the images you share on social media. Which online photo and video editing platform do you like to use the most to add vignettes to your still and moving pictures? Let us know in the comments below. How to Create a Heat Distortion in Adobe After Effects? How to Change Colors in Adobe After Effects?